I don’t drive. There used to be a time when I was a teenager when I was antsy to learn. One of my brothers taught me how to start a car, mainly just so there’s someone to rev the engine (it wasn’t being used much those days). I was content with my daily chore, until I managed to badger the driver into reluctant assent to teach me. I remember barely able to contain my excitement sitting in the driver’s seat as I try to grasp the driver’s instruction. Clutch-shift-accelerate, clutch-shift – accelerate, clutch-shift-accelerate, I mentally chant. Taking a deep breath, I release the clutch, shift to first gear then step on the gas pedal. That’s when my life changed. See, I have as much grace as a rhinoceros in a china shop. I don’t know why a rhinoceros would be in a china shop, but it’s akin to being in the path of a stampeding herd of wild rhinos in the African Savannah: you know it’s going to be a disaster. The orange Beetle lurched in a burst of speed and everything that the driver taught me flew out of my head. My mind was blank and nothing that he was screeching was registering in my brain. He wrestled me for the wheel while at the same time trying to reach the brakes. The car hit the curb and I was woken from my reverie, thereby dislodging my right foot from the gas pedal. As soon as I was sure we weren’t moving, I clambered out of the car, never to return. I drove for less than a minute, the car move a less than a foot from its original parking spot, our speed reaching a heart-stopping 5 kilometers per hour. All thoughts of driving were vanquished that day. It felt as if I was driving that fast. Really. I do, however, enjoy road trips. There’s something novel about driving to your destination as oppose to flying or taking the bus or boat. The drive completes the experience, from the bickering on which music to play to the annoyance upon the nth “are we there yet” whined in the brattiest voice. Of course, being unable to drive means I can nap as much as I want in the backseat. The prominent road trip memories in my childhood were the annual family trip to one of Pansol’s hot springs. Every summer, the family drives south to Laguna to beat the heat by soaking in a hot pool. Thinking back, that doesn’t make much sense. Then again, a swimming pool is a swimming pool (just like Anna Dizon is Anna Dizon). Every year, my dad would say we’d leave early, yet we always end up leaving an hour or two after the set time. My mother would be fussing about, insisting we’re forgetting to bring something, and I’d be whining because we’re not leaving yet. Everybody would cram inside the jeep, probably breaking a record somewhere of the most number of people, bags and pots to fit inside a vehicle. The trips to Laguna ceased when my siblings started getting married and moving out of the house. It was only last April, that I was able to go on a road trip with family again. I went with my brother and his family to Bicol, going around Camarines Sur, Albay and Sorosgon. 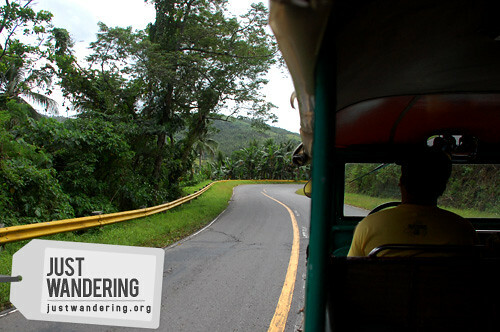 Though we had to rely on public transport in Naga, Legazpi and Donsol, we got to use the same green jeep around Bulusan that we use to ride on those trips to Laguna. 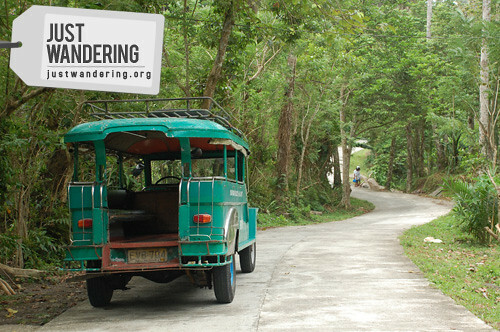 From Bulusan, we drove to Irosin and Matnog, exploring new beaches and revisiting sites we haven’t seen in years. 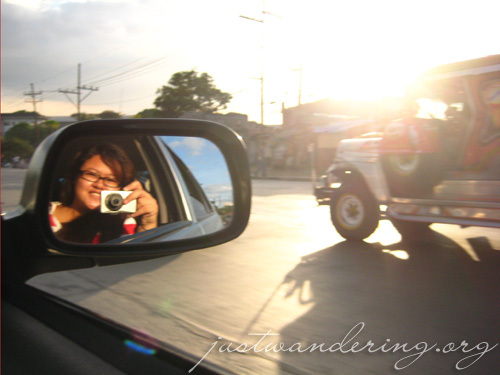 One of the memory that stood out from that trip though, was during the drive to the Legazpi airport. Our flight is at 10am, so we had to leave Bulusan at 5am. I forego sitting in my usual seat, opting for a more comfortable spot to sleep. I piled my Rubber Ducky bag on top of Viktor (my backpack), hugging it as if it’s a pillow and promptly dozed off. An hour later, I was jolted awake. I looked around, wondering what woke me up until it finally dawned on me: I need to pee. The universe working the way it does, made sure I realize it just as we pass a gas station. It all happened so fast. One second the station was right in front of us, the next it was a speck in the distance. Addled with sleep, it took me a while to regain my wits and tell the driver that I need to use the loo. “Meron pang isa, malapit lang,” he said. I’ve traveled long enough to know that people in the province have a different concept of distance from us living in the city. What they consider near is actually several kilometers away. I’ve also experienced more than enough roadside toilets to know that they’re bound to be dark, muddy and stinky. I distracted myself by listening to music and playing games on my iPod, hoping that we don’t hit a speed bump or run across a funeral procession, else I’d really lose it. Literally. Just when I thought I won’t be able to hold it in anymore, I see a star in the distance. Relief flooded through me as the Caltex station loomed closer. The driver has barely stopped the jeep when I practically flew out towards the toilets, ignoring the fact that I’m getting my feet wet on the small puddles around the station from the morning drizzle. I braced myself to meet the toilet from hell, but as I opened the door, I was welcomed with a brightly lit room with a dry floor and a roll of toilet paper. Hallelujah! I walk back to the jeep with a spring in my step, happy to be relieved of my problem (pun not intended). As I settle back in my seat, I got to thinking about how long the jeep has served the family, and how many more years it will be on the road. It got me thinking how long I’ll be on the road. Though I’m not traveling much this year, I’m hoping to travel more as soon as I get my responsibilities in order. 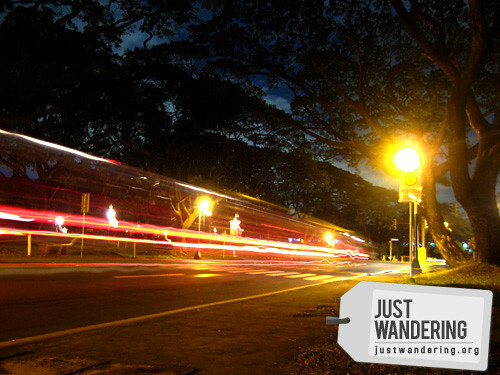 In the meantime, I’ll scratch the travel itch with road trips north and south of Manila. I think I’m due for another one. To celebrate their 75th anniversary, Caltex is giving away 5 Toyota Fortuner and up to 75,000 worth of fuel. Customers get one raffle coupon for a minimum purchase of Php 500 worth of any Caltex fuel. Promo runs from July 15 – October 25, 2011. Raffle draw dates are on September 5, October 5 and November 7. For more details, visit the Caltex website or the Caltex Facebook Page. Go back behind the wheel again and soon, otherwise you’ll wind up like some old ladies I know who never learned how to drive. So there’s hope for me yet! We’ll see. I think I’ll try riding a bicycle first. I attempted to drive pero iba na kasi pag nasa totoong kalsada na,natatakot na ako kaya di ko rin tinuloy.”a swimming pool is a swimming pool (just like Anna Dizon is Anna Dizon)”.hahahaha. I did that Bicol road trip with my dad when I was a kid. We got all the way to Leyte. Wonderful memory, just like yours.